Here is the Merle Haggard Telecaster neck joint. As far as I know it is the only maple "set-neck" guitar. You can also see the grain in the 'ivoroid' binding. Here's another shot which shows the problem posed by using the Fender 'one-piece' (meaning without a fretboard) maple neck in a Fender set-neck (as opposed to a bolt on). The skunk stripe* seems to be the poser. 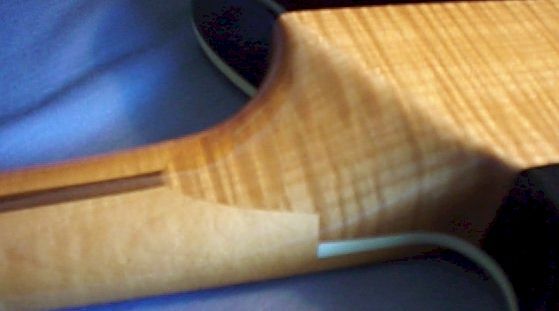 *For Those who do not speak guitar, the 'skunk stripe' is the (darker) walnut inlay along the back of the light colored maple neck which fills in the rout where the steel truss rod was inserted. Walnut is preferred to maple for this inlay. 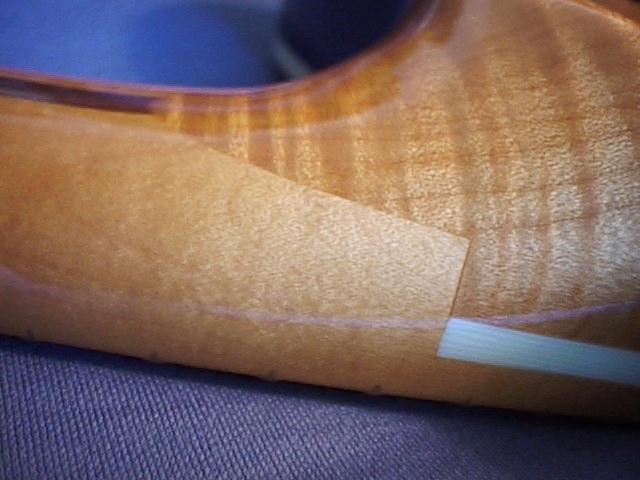 It is a characteristic of Fender maple necks that do not have fretboards, although in rare cases skunk stripes have been seen on guitars with fretboards. When Leo Fender eventually went on to G&L guitars he changed the way to insert truss rods in maple necks - they saw the whole neck the long way and sandwich the truss rod between the two pieces which are glued back together with no skunk stripe.